As a child (okay, and as a young adult, too), I was a huge, HUGE fan of overalls. I had multiple pairs, from the everyday blue denim to white (like in the photo above) and black. I had them in shorts, I had them in pants, I had them in dark brown corduroy. Yes, I was a bit obsessed -- and I don't mind admitting it! Today, I thought I'd take you through just a few photos of my longtime love of overalls. With my newborn brother. As you can see, the obsession started young. With my brother again, this time in costume for a production of Pinocchio (he was Lampwick, I was a Narrator). I chose my own costume, and of course HAD to go with overalls and a fedora. Again for Pinocchio, this time with the rest of the Narrators (and our music director's kid, Toby). I was the mastermind behind our coordinating denim overalls and dresses. Side note -- three of these girls are now moms. Toby is in her 20s. I feel old. With my friend Heather in high school, after we sang "At the Ballet" during a Show Choir Festival. We color coordinated our tops. I paired mine with white denim overalls. Hanging out with my bestie, Katie, at an event for her church. We did not plan our outfits -- but there we are, both wearing velvet turtlenecks, shiny black shoes and fun socks. That was my all-time favorite pair of overalls, too -- they zipped down the middle. 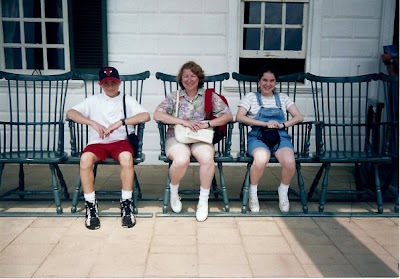 On a family vacation to Washington, D.C. We were at Mount Vernon. I, of course, was wearing denim shortalls. Were you ever a big fan of overalls? Let me know in the comments! I'm STILL obsessed with overalls, and at this point in life, I'm not likely to get over it! Love 'em to death. Best thing ever! I understand the obsession! :) So many companies are putting out really cute ones right now.